4/29/2017 Henry and Tim caught their limit today. 3/24/2017 The perch are still biting. Some spots are better than others. 5/28/2016 Bill Lynch and friends caught their limit of walleye on Saginaw Bay while we listened to old music on the radio. 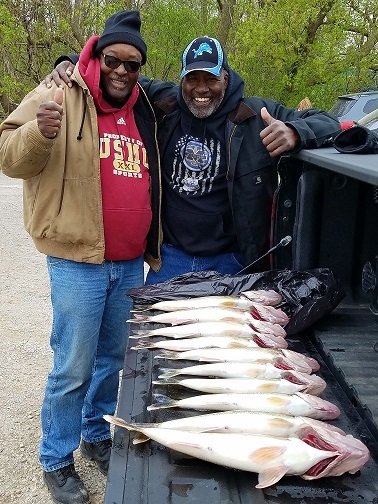 We trolled a lot of Saginaw Bay but found a few hot spots that held bigger fish and had a great catch..
5/28/2016 Duane Provonche and his co-workers caught their limit of walleye on Saginaw Bay. We had fun this morning, fished through a quick shower and then the fish turned on after. 5/21/2016 John, friends and family caught walleye today. We started oout with spoons, but because the water was cold we switched to crawlers after a couple hours. 5/19/2016 Jack Murphy and his family caught a five pound walleye this morning, fishing was real slow to start as cold water was blown in from Lake Huron by the NE wind. 4/30/2016 Hunter Woodward and his friends entered into the Freeland Walleye tournatment and chartered us to catch fish in Saginaw Bay. While we didn't catch any fish over five pounds either day, we had great fishing success with over 20 fish today, including a small mouth bass, and 2 pike, one of which was released. 5/1/2016 Stanley Woodward is out again today looking for a ten pound walleye. They caught a bunch that are were going to a fish fry. Click here for pictures from previous years. Click on the Weather to find out the temperature each of the next 10 days for the Linwood area before you come walleye cahrter fishing with me. The NOAA forecast link is to find out the marine forecast (wind direction and wave height) for the next 5 days. Be sure to check with me within 48 hours before your trip for the most accurate weather updates - Call me on my cell 989-928-2810. I have seen it change as weather fronts get delayed or stay further south or north than anticipated. To find directions from Mapquest, click on the Directions button. Zoom out to find Linwood. The boat is in slip J12, located at Linwood Beach Marina, 135 S. Linwood Beach, Linwood, Michigan, USA 48634.